Go to the Websites & Domains. Specify the name of the Addon domain or the new domain that you want to add in your web hosting account on this page. Select the type of hosting you want to create. If you want to host a website for this domain, select Website hosting. Just below that, you can see DNS settings. 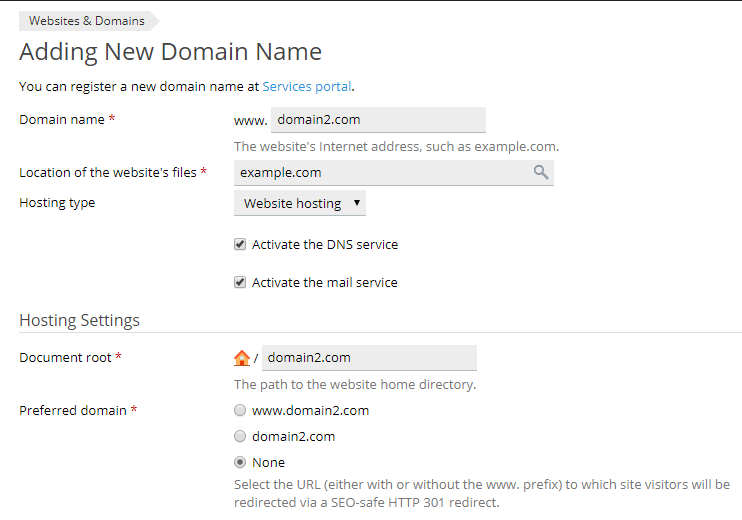 There you can select from the options whether you want to use local DNS server or external DNS server for the domain you are creating. Then you can see Mail Settings. If you want to use email service for this new addon domain please select this option. Then below, under the title Hosting Settings, Document root enter the Path for the website home directory. The new addon domain name is created and now shown in the list at the bottom of the screen. You can now start to upload your web content to the web space of the new addon domain website.